When you take trips out of town often, you would want to be able to take your personal mobility device with you to enjoy your independence no matter where you go. For this, it has to be not only fairly compact, but also quite lightweight. 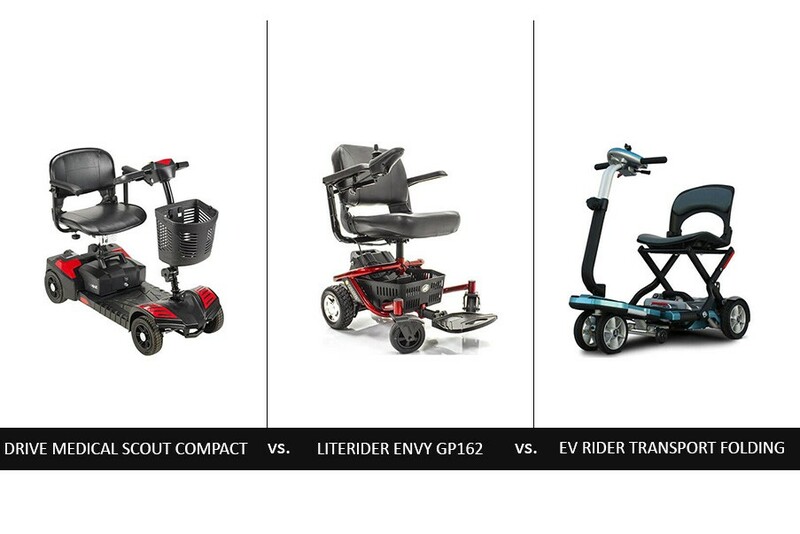 I’ve done a great deal of research to identify the best lightweight mobility scooter and I’ve come up with the three top units. Use my reviews of these scooters to decide which one would be the best for you. Before I tell you about the size and weight of this unit, I want to discuss its design. It has four wheels instead of the usual three and this will give you a more stable ride even if the terrain is a bit rough. The 4-wheel design could make this model the best lightweight mobility scooter for people who prefer stability over taking sharper turns more quickly. You will be happy to discover that Drive Medical Scout weighs only 94 pounds which is great given its design. It can be disassembled into 5 parts quickly and without much effort on the part of the caregiver. The heaviest part weighs just 58 pounds. The scooter is 42.5 inches long and 21.5 inches wide, so it’s quite compact to park and to transport. It has a user capacity of 300 pounds which is pretty much standard. Stadium seat with adjustable height – While it may not be the widest or deepest measuring 16.5 by 16 inches, I find it to have great ergonomics and back support in particular. Removable and width-adjustable armrests – It’s easy to flip them when you are mounting and dismounting the scooter. They give you extra comfort, even though they aren’t very wide. Adjustable tiller – You can adjust both its angle and height for maximum convenience. Besides, you get wrist support when your hands are on the controller. This is what you’d expect from the best lightweight mobility scooter. Storage basket – It’s deeper than it appears at first sight and it’s extremely functional because you can reach it easily when riding the scooter. With its 8-inch anti-tip wheels and reliably working motor and brakes, Drive Medical Scout is a fabulous performer on smooth and slightly rough surfaces. You’ll enjoy smooth turning, even though it won’t be the fastest. The top speed of 4.25 mph is perfectly sufficient for rides in the city. The maximum range of 9 miles is reasonable. Drive Medical Scout scores high in terms of stability and performance and offers a great deal of comfort and convenience too. It could easily be the best lightweight mobility scooter for you. 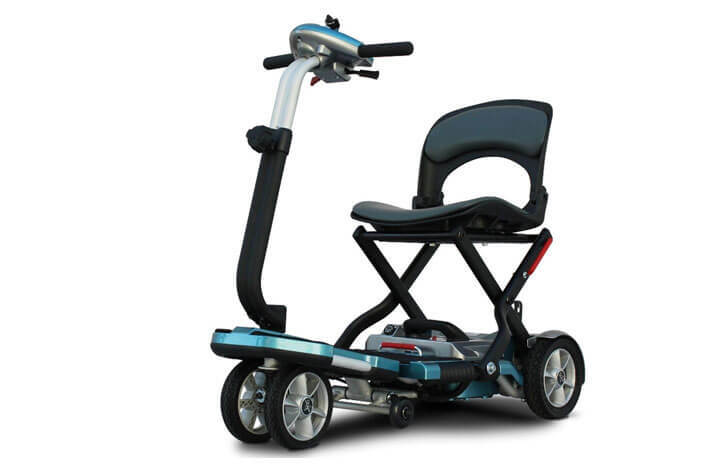 With a weight of 116 pounds, this mobility scooter is quite lightweight. What’s more, it’s incredibly compact measuring just 33 by 25.5 inches. It could be the best lightweight mobility scooter for both indoor and outdoor use. Its capacity is 300 pounds which is good news for bigger guys like me. While it’s very compact, LITERIDER Envy GP162 is completely stable. 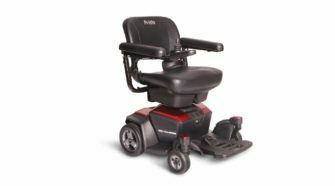 It uses two 9-inch rear drive wheels and two 6-inch front casters which give it both stability and impressive maneuverability. You should also not worry about transporting your scooter to different places. It is easy to disassemble into 4 pieces, with the heaviest one weighing just 35 pounds. Tubular frame – It’s compact and very strong at the same time. I appreciate that it’s built to last. Stadium style seat – It’s 17 inches wide, 16 inches deep and 16 inches high. I like the thick padding and the ergonomics. You can expect it to be comfy. Under-seat storage – The amount of space is perfectly sufficient for keeping some personal items and possibly even some groceries. Folding footrest – While it’s stable and well-designed, I wish it could be larger. Compact joystick controller – You can choose which side it will be mounted on depending on whether you are right-handed or left-handed. It has great responsiveness and works well. 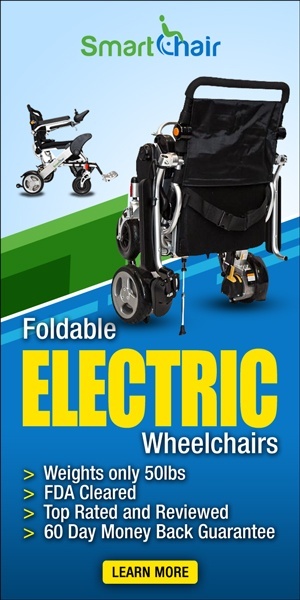 The motor is dependable and so are the two batteries of this personal mobility device. It cannot reach a higher speed than 3.5 mph, but you will most certainly not need to go faster when you go to the nearby shopping center, for instance. 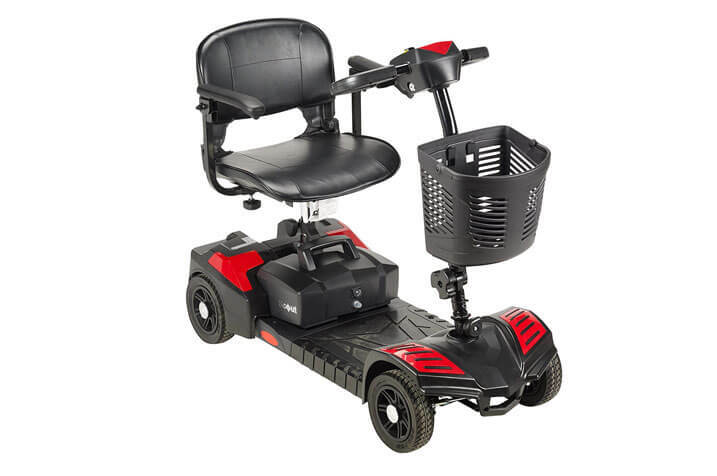 The model has impressive maneuverability with its turning radius of 26 inches. It has a great travel range for its compact size – 15.5 miles. If you want a versatile and dependable personal mobility device that you can use at home and outside, LITERIDER Envy GP162 may be the best lightweight mobility scooter for you. With its weight of just 70 pounds, this model may be the lightest mobility scooter you can find. What’s even better is that it’s easy to fold for transportation when you travel by car, bus, train, boat or plane – you name it. Without the batteries, the unit’s weight drops to 46 pounds and it’s extremely compact when folded. This model may be the best lightweight mobility scooter for those who travel a lot. All these are great benefits, but you also have to take into account the fact that this model is more compact than its counterparts and has a smaller capacity of 250 pounds. Another key thing to note is its design. It fairly long and not particularly wide, but has two front wheels for added stability. Seat in stadium style – It’s nicely padded and has excellent ergonomics. It’s quite comfortable and you should not worry about stiffness even when you take long rides. Adjustable tiller – Set it at the best height for you to steer the scooter comfortably and confidently. Carpet flooring – It feels awesome, although it requires cleaning more often. Headlight and taillight – They are invaluable when riding in crowded places. You can expect to find them in the best lightweight mobility scooter. 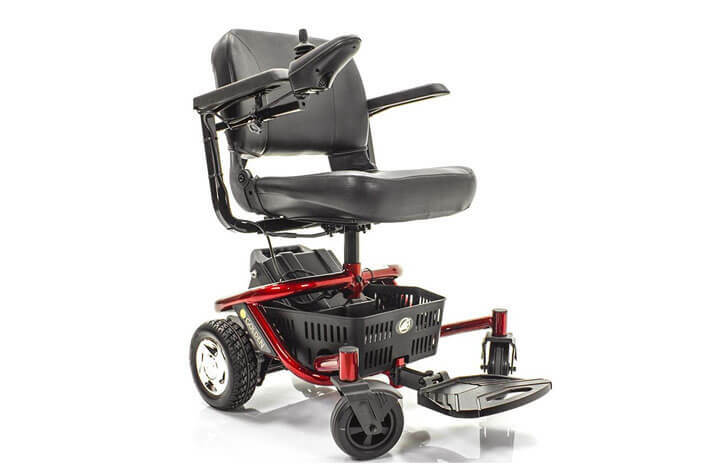 Both the front and rear wheels are big and sturdy enabling this foldable mobility device to perform well even when the terrain isn’t perfectly smooth. The motor, transmission, and brakes work reliably, while the scooter is easy to steer. I love how maneuverable it is with its turning radius of 32.3 inches. You can reach a top speed of 4 mph. The SLA batteries are quite reliable and you can always upgrade to lithium-ion ones. The travel range is around 12.5 miles which is quite good. You can’t rest your wrists when holding the handles. This EV Rider model has great design and performance in addition to being easy to transport. It may be the best lightweight mobility scooter for a frequent traveler. Consider your individual level of mobility and lifestyle to make the best decision. Pay attention to the design, performance and features. Don’t forget to look at the capacity when choosing the best lightweight mobility scooter.